Brantford – On July 1, 1867, a tightrope walker hired to perform at Brantford’s Confederation Day celebrations vanished without a trace. A century and a half later, that unsolved mystery is the inspiration for Framed in the Past: The Tightrope Walker, a live puzzle challenge designed by students taking part in North America’s first Escape Room design class through the Game Design and Development program at Wilfrid Laurier University. 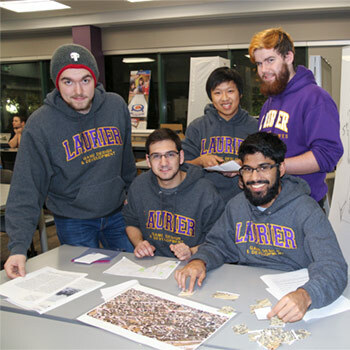 Laurier students invite members of the public to test out their sleuthing skills by taking part in this team-based challenge on the afternoon of Saturday, Nov. 18. The event is offered at no charge, but organizers are requesting that teams make a donation to the university’s United Way campaign to reserve a slot. The premise of the game is that players are applying as criminology interns to join Framed in the Past, an investigative agency specializing in historical crimes. Throughout the course of their one hour of play, participants will collaborate with their teammates to solve paper puzzles, visit student actors in downtown Brantford, and unravel the mystery of the disappearing tightrope walker through a narrative live-action puzzle-based adventure inspired by local history. Two versions of the game will be offered: Family and Gamer. The Family track is simpler and is appropriate for ages 10 and up. The Gamer track is more intense, both in the story and in the challenges, and is not recommended for those under 16. Those anxious to try their hand at solving this conundrum from local lore are encouraged to register soon as space is limited. Participants can register online. Spots must be reserved by Nov. 12. The first set of teams of four will start at 1 p.m., with additional flights launching every half hour until 3 p.m. The game is designed for teams of four but smaller teams and individuals are also welcome and may be grouped together.